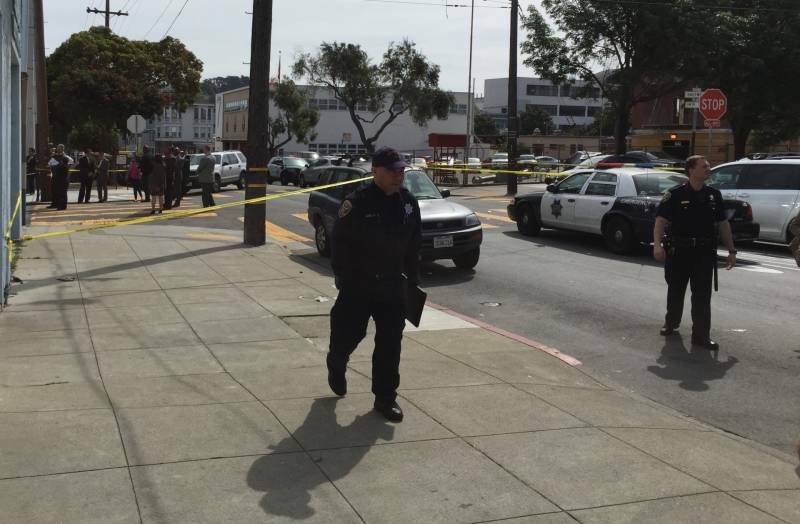 The San Francisco Police Department released the names on Friday of a sergeant and an officer who fired a total of seven .40-caliber rounds at a homeless man in the Mission District last week, mortally wounding him. Some witnesses and the officers have said Luis Gongora charged police with a kitchen knife after they contacted him the morning of April 7, according to the Police Department. Other witnesses told reporters that Gongora was not holding a knife or did not run toward the officers. A department spokesman identified Sgt. Nate Steger and officer Michael Mellone as the two officers who fired during the incident. Sgt. Nate Steger is a 17-year-veteran of the department, according to a statement from Police Chief Greg Suhr on the seniority of officers involved in the shooting from earlier this week, and has spent much of his career assigned to the Mission District. Officer Michael Mellone has a combined 13 years of experience in law enforcement, transferring to SFPD four years ago, according to Suhr's statements Wednesday. He was the first SFPD officer to administer a nasal dose of Naloxone to a man overdosing on opioids last year near 16th and Capp streets, in the Mission District. Mellone may have transferred from Antioch Police Department; a Detective Michael Mellone is named in a 2011 federal lawsuit against Antioch and six of its police officers alleging excessive force, unlawful search and seizure, assault, battery, false arrest and other civil claims. The lawsuit claims Mellone and other Antioch detectives served a search warrant in the early morning Jan. 13, 2011 at the Pittsburg home of Edrick Harvey, having trailed her son Alvin Harvey there the night before. The suit alleged the officers "tackled, handcuffed, and electrocuted Plaintiff Edrick Harvey with an electronic control device, presumably a Taser. The defendant officers then manhandled [Angel Smith], wrenched her arm, choked her, slammed her to the ground, handcuffed her, and electrocuted her with an electronic control device, presumably a Taser." Antioch settled the case in 2014, and paid a $135,000 settlement to Smith and another of Harvey's children who was present during the search. Harvey died before the lawsuit's settlement. The Antioch Police Department did not immediately respond to inquiries late Friday evening, nor did attorneys in the case. Mellone had undergone CIT training, according to statements from Suhr, but it's unclear whether that was in San Francisco or before he transferred to the department. Suhr said at a Police Commission meeting Wednesday night that the CIT trained officer involved in the shooting was the one who can be seen firing a shotgun with "less lethal" beanbag rounds in surveillance video published by SFGate last week. There are no lawsuits naming Sgt. Nate Steger as a defendant in either federal or state jurisdictions covering San Francisco. He's a member of Blue Courage, a law enforcement leadership and peer support organization. Steger began his law enforcement career with the Metropolitan Police Department of Washington, D.C., according to his Blue Courage profile. In San Francisco, he's served as an internal affairs investigator, patrol officer and in SFPD's plainclothes division. He's also worked in the department's training division and is a state-certified police instructor. He's also been a field training officer for the department. Steger is mentioned in two 2007 San Francisco Chronicle articles in which reporters spent substantial time with SFPD officers. The articles describe a tense chase through the Mission District that ended in a search and traffic citation and the work of beat cops in Valencia Gardens.